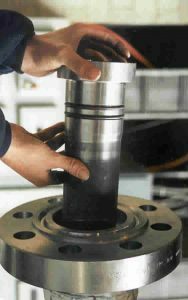 Dewatering hydrocyclones vary in size as they are required to perform a number of different tasks, and the application is more complex than standard deoilers due to the wide varying water:oil ratio. Feasible applications can generally be classified as either water continuous (70-90% water cut) or oil continuous (10-30% water cut). 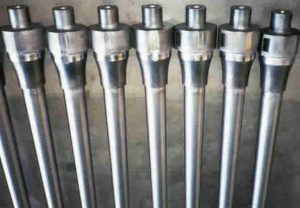 The hydraulic characteristics of these type of hydrocyclones can vary significantly, and depend on water cut, fluid viscosity, and operating pressure. As a rule of thumb, the capacity of a dewatering hydrocyclone is generally 30% higher than a deoiler of the same size and pressure drop. Dewatering hydrocyclones must be installed as far “upstream” as possible in the process system, where the greatest level of pressure and temperature can be best utilized. Useful separation is expected at oil viscosity of less than 10 cSt. The inlet stream to the dewatering hydrocyclone should be substantially gas free. The overflow and underflow streams typically require additional processing either by second stage deoiling hydrocyclones or conventional separation equipment.